Here we go September, breaking down all the doors with its new September-ness. Here’s something different I'm trying this September: Posts made up of Five Things. These things can be bits of grace, they can be funny things, they can be frustrating things. These are the things you pull out of your pocket, at the end of the day, and arrange on your night table. These are the thoughts and memories you gather throughout the day. These are the things you paste in your journal. There are no rules, really, I just want to write about five things, to jog my brain and memory and not forget-- it’s the not forgetting that’s the most important— these years are an avalanche of challenges and gifts and I want to remember it all. 1. Leaf and Brendan, our Aussie friends who live in Northern India, are here with their son for a couple of weeks, and I am over the moon. I am always enlivened by being with them. They have the kind of marriage that inspires and embraces, they are the kind of people we can be serious with, laugh with. We have grown together more and more over the years. 2. Kai had his eleventh birthday party on Sunday and it was a blast. I cooked feverishly because that is my recipe for parties: just make enough food to heap on everyone and it will go well. Kai is eleven, you guys. Eleven! This growing up boy got the simplest Kindle for his birthday. Now we need a budget for books to go along with that Kindle! I’ll direct gift givers toward Amazon gift cards for this boy who inhales books. (It’s a good thing he’s a re-reader, like me. Although unlike me, he retains every bit of information that he reads in every book. I forget easily, therefore books are like new to me every time.) And there are also all the free classics. I put Kai and Kenya in charge of the games and they came up with something that had a bag of shame. If you were selected, you had to fulfill a “fate” that was written on a little piece of paper. Brendan got the fate of having to eat a spoonful of salt, sugar, and chili sauce, and the shrieking and hilarity this caused was enough for a year’s worth of silliness. He really played his role well, flinching and squirming and being generally dramatic. The kids loved it. 3. We are working on our meditation space and I fall more in love with it every time I spend time there. Yesterday was a work day, and the plan was to get all the plants that I bought in the plant market in Chiang Mai into the ground. 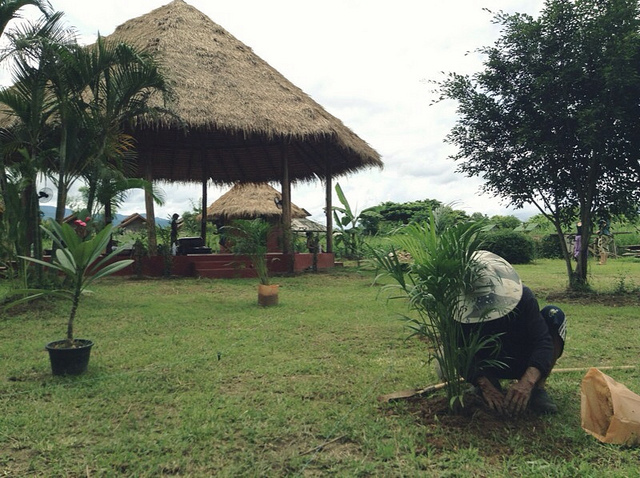 I placed plants where I wanted them and Ya, the old rice farmer who was helping us, dug them in. He worked all day and we got it all done. I’m thrilled. Chinua and the others also moved wood out of the way and burned the scrap wood. I love that place. It is so beautiful and already feels so peaceful and like a sacred space. I can’t wait to spend more time praying, singing, meditating, and eating food with guests there. 4. Isaac got an impromptu cold water bath after a scary and traumatic event yesterday during our work at the space. He seemed hot in his clothes, so I ran home to get a t shirt. I laid it on the floor in the big building and took his clothes off, then put the new shirt on and picked him up to nurse him. He was crying like he really wanted to nurse but then he kept pulling away and crying more. This went on for a few minutes until I noticed an ant on the edge of his diaper! ACK! His shirt was full of biting ants. I pulled it off him and called for Chinua to get them all off with me and together we got all the nasty little bad ants off my poor baby. When I set the shirt on the floor, I must have set it in a swarm of ants and they all crawled inside the shirt. He welted up and those things are painful! So we pulled a bucket out and put him in it with some water. Soon he was splashing happily, wildly even. He didn’t seem to react much to the bites after that (I’m allergic, so my bites swell a lot.) I was horrified, though, especially over those few minutes when I didn't know what was happening to him. Poor kid. 5. Yesterday Solo was “helping” Brendan pick rocks out of the ground by lying in the rock collecting bucket and requesting that the rocks Brendan picked be put on him. When it was time to empty the bucket on the pile, he lay down on the large rock pile and asked Brendan to pour the rocks on top of him. Which Brendan did, because he has all the patience in the world and doesn’t get grumpy pants with five-year-olds who are quirky as all get out and always want to do things the weird way. Oh, Solomon. We love you. You can play along with Five Things, if you want. Write them in the comments or link to your post. Follow Solo's example and be as quirky as you want to be.